Anyone who’s tried to tackle lawn care in a blustery, wet spring knows that nothing can create lawn and mowing problems like heavy rain. Standing water, mud, and long, damp grasses provide less-than-ideal conditions for pulling out the mower. But it’s necessary because heavy rain can cause an equally heavy growth cycle—and growth that eventually needs to be cut down. There are ways to maintain your lawn even during heavy spring rains. Although you’ll need to take a little more care than usual, you can make the most of the new growth without sacrificing your lawn’s appearance. Anytime there’s standing water on a lawn, bringing out the mower might damage the lawn. This is especially true if there was flooding, in which case you’ll need to deal with silt deposits and other damage to the grass. Wet grass tends to be heavier than usual and may even bend over. This can make a clean cut difficult even with the best equipment. At the same time, the clippings that result from mowing are likely to be just as damp as everything else. It can clump, get stuck in the mower blades, and cause unsightly deposits all over the lawn. This may mean you’ll need to rake the clumps and clean out your equipment in addition to your regular mow cycle. Excessive moisture can also soften the underlying dirt, which may sink when you—and your mower—pass over it. This can cause ruts and mud tracks, which often have to later be reseeded. Fortunately, there are steps you can take to improve the appearance of your lawn and even make the most of the rain cycle. Ideally, you should wait until the lawn has dried out before you mow. This doesn’t mean it has to be bone dry and all moisture gone—it simply means that if you can see water on the lawn or on the grass blades, you may want to wait until it’s absorbed before you mow. Regardless of how wet the grass is, set the blades to the highest setting. This will help you avoid clogging and keep your machine in good repair. 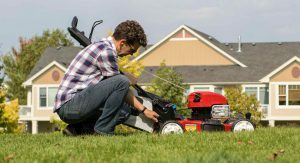 This may mean that you’ll have to mow more often than you’re used to, but your lawn—and your lawn mower—will thank you for it. A lawn that has been waterlogged or is showing signs of flooding is a lawn you want to walk on as little as possible. Too much foot traffic could tamp the blades down and draw the mud up—two things that are likely to make the lawn worse rather than better. Limit the amount of foot traffic and use a walk-behind mower or zero-turn mower that allows you to get the job done more efficiently. You don’t have to stop your planned spring mowing due to heavy rain, but you should take extra precautions before you head out. Avoid mowing over mud and silt, take care to let the grass dry as much as possible first, and plan on being more diligent until the weather clears. Your lawn will thank you for it.